The building as imagined from the sidewalk on Wilshire. The Los Angeles County Museum of Art has released new renderings of its Peter Zumthor–designed building, following an environmental impact report released on Friday by the chief executive office of the county of Los Angeles, Curbed LA reports. The Pritzker Prize–­winning architect has scaled down the structure, making it 347,500 square feet—40,000 square feet smaller than the previous design and 45,000 square feet smaller than the size of its existing four buildings. Construction under the revised plan is also expected to be expedited, taking fifty-one instead of sixty-eight months. 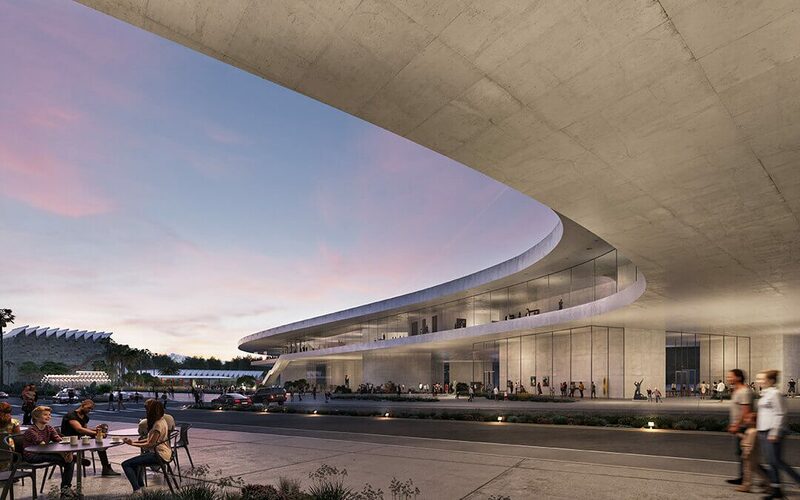 The museum’s four buildings will be razed for the new structure—a continuous undulating concrete building that raises LACMA’s main exhibition level above Wilshire Boulevard and connects seven ground-level concrete and glass pavilions. The project is slated to begin in late 2019 and is expected to be completed in 2023, though inflation and US tariffs on steel, among other factors, have threatened to delay the project’s schedule. The museum has also stretched its original budget of $600 million to $650 million, to allot for contingency costs.